- operate to confiscate assets that were acquired by U.S. citizens after they moved from the United States. The term “covered expatriate” means an expatriate who meets the requirements of subparagraph (A), (B), or (C) of section 877(a)(2). This means that one was born in the United States and acquired dual citizenship from your parents or you were born outside the United States to American(s) abroad. (2) As of the expatriation date (the date you relinquished U.S.
citizenship you continued to be a citizen of THAT specific country that you acquired dual citizenship from birth. (3) You are taxed “as a resident” of the country referred to in paragraph (2) above. Note that this says “taxed as a resident”. Does that you mean that you must reside in that country? What if the country does NOT impose taxes on its residents? Code) for not more than 10 of the last 15 years. A. Are finding it very difficult to exist as a U.S. tax compliant U.S. citizen abroad. Those Americans abroad who are compliant with U.S. tax laws have agreed to live life under extreme disability. See: “How To Live Outside The United States In An FBAR and FATCA World“. Remember that “When an American is in Rome, that American must live as a Homelander”. B. Are feeling that they are forced to renounce their U.S.
Those Americans abroad who WERE born dual citizens, do have to deal with the compliance problems but do NOT have to fear becoming a covered expatriate (assuming that they meet the “U.S. tax compliance test). Therefore, it is easier for those who are “dual citizens from birth” to remain U.S. citizens (for at least a longer period of time). This post has been partly motivated by the interesting discussion by a young woman in the UK who was born a dual U.S./U.K. citizen who is dealing with her discovery that she must file U.S. taxes. By the way, if you would like to see the brutality of the Exit Tax in action and how it discriminates against those who were NOT born dual citizens, read these examples of “ The S. 877A Exit Tax In Action – 5 Examples (including the effect on those who were NOT born as dual citizens”). Those who were born dual citizens may have “won the birth lottery”! But, Ted Cruz doesn’t seem to have realized this. « Did #Obama’s #FATCA shake 8 EUR out of every #German pocket? Being a non-resident US citizen is never about making good decisions for one self – it’s about making the least-worst ones. The fact that I will never be subjected to the US exit tax as long as I remain US tax compliant may reduce the urgency to renounce, but also gives me one other thing to consider when making those least-worst decisions. …and the same year the HEART Act became effective. – for whom none of this makes a lick of sense (to me) as that person is seemingly entrapped with no way out of a non-meaningful / without choice or *claim to* USC? Why bring Ted Cruz into the discussion? He has nothing to do with this. He’s running for President as a ‘natural born American. He couldn’t ditch his Canadian citizenship fast enough (good riddance), He would never think of leaving the good ol USA so the point is meaningless. The day I believe I may have won the birth lottery is…. wait for it….. NEVER. Ted Cruz was born in 1971. He was therefore born a Canadian citizen. Now that is a non sequitur. >He would never think of leaving the good ol USA so the point is meaningless. Maybe you should wait to see if Bernie is elected before making such a statement? We certainly have had different experiences in Switzerland! I enjoyed myself in the 3 weeks I was first here in 76, made about 10 friends in that time, one of whose daughters was named after me. It was such fun that I came back again for 3 months that same year and met my husband. Out of the last 40 years, I’ve lived here for about 34. I even loved this strange musical language – hearing it from groups at the next table, young and old – interspersed with outbursts of hilarity. I do agree that what I considered the older generation at the time – now I am one of them – was more reserved, probably accounting for the only positive thing you had to say, that celebrities etc. are left alone. Perhaps we are not the same age and perhaps you were in a different milieu when you arrived in 86. I know a number of U.S. here and we have all had extremely positive experiences with, of course, the exception of CH bowing down to the bully. NB. This is not my first comment but I don’t remember my user name from 4 or 5 years ago. I intend to start commenting, first with some questions, I haven’t identified the appropriate thread yet altho maybe I’ll simply use one of the ones with high traffic. Again, slightly off-topic but is one of my questions: One of the regulars here – Em? has never received her I-407 and is in limbo. Supposing someone over the years had simply lost their green card, having returned to their “home” country and knowing that it had been revoked years earlier and not knowing of the requirement to formally abandon, simply didn’t manage to keep track of it. Do they have any recourse? If not, they are in the worst possible situation – altho less detectable re POB – as they will be USP for tax purposes til kingdom come. Amirite? I really can’t figure out where to put this question. I’ve been lurking for years and have noticed many posts where it seems obvious that the poster does not want to be identified. What assurance do they have that their e-mail address and hence their identity can’t be hacked? Or is this only people who reiterate over and over that they will never cross the border and therefore they can take that risk? This will be a long diversion from the main intent of this topic, but the extent of the pernicious Exit Tax goes far beyond what is being discussed here. I must warn, the following is my interpretation of the rules, and may well be wrong. First, I’d like to thank John Richardson for the “5 examples” on his own site. I’ve spent hours dissecting the examples. It’s possibly the best resource for fully understanding the impact of the Exit Tax to be found. To start, when discussing the Exit Tax, we’re dealing with 2 sections of the Code, 877 and 877A. Their interaction, as Johns’ notes above explains, is the key to understanding the “Gotcha’s” contained in the tax. Section 877 came into being in 1966, and contained the ten years of returns we often hear about. It was amended in 1996, and most importantly, in 2004 when the $2 Million/5 years of income was added. It also introduced the concept of assuming tax avoidance and the covered expatriate based on the net worth and liability test. 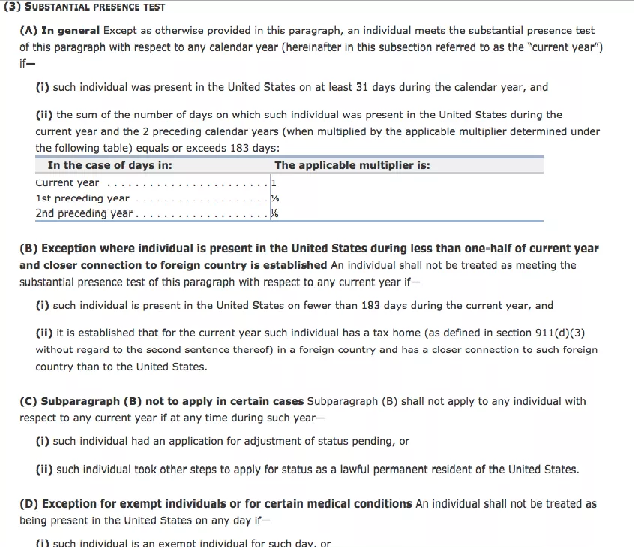 It also gives rise to Part II of Form 8854. Section 877A was introduced in 2008 and further defined deferred compensation. Most importantly, as John points out above, one may escape the Exit Tax if born a dual citizen, but the 3rd test, 5 years of past compliance, still remains and one may still be classed as a covered expatriate if this test is not met (by referring back to only (A) and (B) of the relevant sections of 877(a)(2)). The full extent of these (true) words may only be appreciated when trying to complete 8854 when someone has been compliant and made the financial sacrifices entailed in being compliant, say for 30 years, and now wishes to renounce US citizenship. They will meet the 5 years of past returns test with no problem, but the twist comes with line 2 of section A of Part IV, “enter your net worth”. Although not a required method, it is suggested in the instructions that the sum on line 2 may be arrived at by using Schedule A of Part V (required) as a guide. For those without the “out” of dual citizenship and residence, arriving at a sum for line 2 becomes a real “Gotcha”. Of course, again as John points out, the qualified dual citizen must also complete the 5 years test to avoid being a covered expatriate under the 3rd test, (the instructions for Part IV says: “This section must be completed by all individuals who expatriated in 20–). The instructions for Part V says: “Section 877A. If you expatriated in 20–, you must complete Part V”. So the qualified dual citizen must complete Part V, but a sum over $2 million on line 2 will carry no further obligations. According to Notice 97-19, (the only IRS issued guidance to be found as to how to determine a “net worth” for expatriation), for Part V of 8854, stipulates one must use the “Gift Tax” rules. http://www.unclefed.com/Tax-Bulls/1997/Not97-19.pdf Things now become complicated. Can a State pension be gifted? Can a company pension be gifted? Is a company pension with rights of survivor automatically gifted? There’s also the question of how to value individual stocks and the dividends, or single shares of a company purchased by the individual (and therefore not PFIC’s and allowed) of which gains have been properly reported, yearly, on a 1040? Or, how to value a company pension when both the individual’s contributions and the employer’s contributions, along with gains, have also been declared yearly on 1040 (the individual has a full “basis” in the pension for 1040 tax rules). As one would expect, the instructions for 8854 are totally devoid of comments concerning foreign pensions on Schedule A – Balance sheet of Part V. The list goes on and on. If the sum for line 2, section A of Part IV is over $2 million, then the Exit Tax must be calculated. Now, the real sting in the tail. Value was determined by the Gift Tax, but calculations for the Exit Tax must be made using “Estate Tax” rules (mark to market plus separate rules for deferred compensation, and 99.9% of foreign pensions will be “ineligible”.) Theoretically, with the “tax free” allowance of 8854, one may escape owing any tax, but it’s highly remote. The conclusion to all the above is that the individual is subject to taxation on income and gains they have already declared and possibly paid US tax on when filing 1040 returns in the past. Even if they do not owe any Exit Tax under the Estate Tax rules, they’ve still been obligated to complete 8854 and become a covered expatriate because they were deemed so under Gift Tax rules. It’s also likely NIIT (Net Investment Income Tax) will come about if they have owned a home in Toronto or Vancouver, have a very good pension from employment, or have made sufficient “allowable” investments. NIIT is undeniably double taxation. Section 877A truly is pernicious. The individual has already declared and paid/offset tax on these assets and may now have to pay again. For some individuals resident abroad for 30+ years it may well be too late to “get out”, the assets already exist. If they’re over $2 million, the best way to avoid becoming a covered expatriate is to gift all amounts over the $2 million limit away before renouncing (and 97-19 has rules on that). Therefore, not only have they already declared/paid, they ideally must now give away a portion of those assets already declared in the past if they wish to avoid being a covered expatriate. One wonders how many “compliant” individuals with intent to renounce have looked at the Exit Tax situation and then quietly decided they’re not able to do so, and continue to be part of system as the only means of surviving abroad. The silent minority. I apologize for the long diversion and would welcome any corrections where I may well have all of this wrong. By the letter of US law, yes. Someone with a (perhaps long ago) expired, but not surrendered, green card remains theoretically able to live in the US, but in practice they are in a sort of maybe/maybe-not limbo. If they tried to return to the US to live they would very likely be denied, at which point their status as a ‘US taxable person’ also terminates. But until they either do that or affirmatively surrender the green card through either I-407 (or possibly some other written notice? ), they are stuck with US tax obligations. So… worse even than a US citizen living outside the US, then. At least the citizen has an inalienable right to reside in the US, even if they choose not to. The holder of an expired green card has no such right, yet all the same tax responsibilities. Outrageous? Yup. - I wonder how one proves that one is a dual citizen at birth. I should probably ask my mother when I got my French passport (I was born in the US). However since I qualified to be French at birth, I suppose that works, even if I didn’t get a passport at birth. - “Does that you mean that you must reside in that country?” – the link above goes to the obvious question, that is also my own situation: I live in another EU country. But not the one I have a passport from. In difficult cases it would probably make sense to claim residence in the correct country when “exiting”. But that may not always be easy. - The title could also be inverted: the Exit Tax may make it unaffordable to renounce, except for those who escape covered status. - S. 877A(g)(1)(B) “dual citizen exemption” could conceivably be tweeked to make all bona fide US persons abroad exempt from exit taxation. It could go along the lines of: “get another passport”, “live abroad a long time”, “renounce”. For homelanders, this might be the type of person you can “let go” because they obviously have a life elsewhere. But it would still “keep in” or “exit-tax” people who “rush” out “just to avoid taxes” (NOT my point of view, just trying to be in their mindset). Here’s a suggestion, for anyone wanting to renounce who’s receiving a UK State Pension. and is also waived under 301.6114-1(c)(2) if this is the only treaty position you’re taking and the amount in question is less than $100,000 – which, for a UK State Pension, it will be. The fact that you don’t have to report this treaty position suggests it’s non-contentious, and unlikely to be queried by the IRS. If you delay renunciation for a few years, excluding the UK State Pension each year, by the time you file your 8854 you can omit the UK State Pension and there will be no discrepancy between what you’ve reported on, say, the last 5 years of tax returns, and the assets listed on your 8854. Note that you should also exclude the UK State pension from the Income you report on the 8854. A disclaimer is in order: iota and myself have discussed the Exit Tax in depth on other sites, and much of the research I mention above has come from those debates. For those who have never filed, or even investigated IRS filing procedures, there may be an inclination to assume IRS publications and instructions explain what is taxed, how it is taxed, and when it’s not taxed. Nothing could be further from the truth. There are areas, and the Exit Tax rules are a prime example, where it’s impossible to determine how the taxpayer should proceed. These are the too often discovered “grey areas” or “black holes” that exist throughout the Code when dealing with despicable foreign assets. Try reading the ” reporting net worth” in Notice 97-19, or reading about foreign pensions in the instructions for completing Part V of 8854 (iota may disagree :-)). There simply is no direction to be found. The individual may seek information from a compliance condor, but in all likelihood on something like the Exit Tax, the CC will also only have an opinion, and not a reference to a precise ruling for every aspect (and if you read carefully, that at times includes Hodgen), but will nonetheless charge £4,000 to state the obvious position that, indeed, the individual is not a covered expatriate. Therefore, as iota has done, the individual does the research and arrives at a position. Iota, in my opinion, has done in depth research and has arrived at what is felt to be a valid conclusion. In this case, iota’s position may be no less valid than that of a CC. For the life of me, and iota may be surprised by this, I don’t see how a UK State pension could possibly be subject to a valuation and reporting for Part V of 8854. Then again, the IRS might prove me wrong. Either way, there is no where one can find the exact, precise answer. You really have a good handle on the issue where the US is switching between using the Gift tax rules for valuation of assets and then applying the Estate Tax rules to determine the Exit Tax (if I even have that much correctly at this point). I have spent time reading about this and have yet to truly grasp it. Lol, no, it doesn’t surprise me at all. I was offering my suggestion not to you specifically but as I said, to anyone considering renouncing and in receipt of a UK State Pension. I’m not trying to convince anyone of the rightness of my view, just sharing in case some of the information I’ve come across might be useful. As for comparing me to a compliance condor – I don’t think that’s very nice. I’m not a condor of any kind. It’s my genuine, good faith understanding that the UK State Pension is exempt under Article 17 of the US-UK Tax Treaty. And it’s hardly a perverse interpretation. Paragraph 3 provides for exclusive residence-country taxation of social security benefits. The proposed treaty, like the present treaty, provides for exclusive residence-country taxation of social security benefits. And, as mentioned, this is a treaty position which doesn’t have to be reported, which is what you would expect for a treaty position that’s accepted as valid. That being said, I completely agree that the safest approach for anyone is to find out as much as possible about what’s actually clearly stated as required, and then make their own decision about the safest course of action. Complicated but interesting. These discussions would be less likely to get lost if posted in the threads where they belong such as “ask your questions about- expat taxes and fbar” The popular threads disappear in a few hours or days. The Canada US treaty provides that social security payments from either country be reported only in the country of residence. It is clear they don’t have to be even mentioned on the other country’s return. In spite of this some compliance condors insist on including them and then claiming an offsetting deduction. Anything to complicate matters. Canada Pension Plan and Old Age Pension are not included in net worth. …payments made by a Contracting State under the provisions of the social security or similar legislation of that State to a resident of the other Contracting State shall be taxable only in that other State. Which can be interpreted as meaning that residence-only taxation applies to cross-border payments (UK pension paid to US resident) but if paid to a UK-resident US citizen, residence-only taxation does not apply. However, that doesn’t make sense to me. Social security pensions are taxable exclusively in the residence country, according to 17.1, and while that paragraph is not protected from the Saving Clause, as para 3 quoted above is, I think that’s just because in the case of a UK pension paid to a UK resident, it doesn’t need to be protected because the UK is both source country and residence country. The fact that the Technical Interpretation also interprets it this way, gives me confidence that that’s correct. I agree this probably in the wrong thread, but a lot of stuff gets found just through googling if a person’s looking for particular keywords. You know very well I wasn’t comparing you to a compliance condor. I don’t think I’ve ever said this to you before on any site, so I’ll say it here. I really admire the way the way you’ve tackled this situation and the amount of research and contemplation you’ve put in to fully understand your situation. (That, BTW, was a compliment.) I still remember your first post shortly after your OMG moment courtesy of NS&I, your determination, and your eventual decision as to where to renounce. You’ve come a long way and it should be a worthy example for those only now experiencing their OMG moment. Aw shucks… thanks OAP – and I recall your kind words, and your advice not to act in the heat of the moment but to think carefully before taking action. Wise words, which were much appreciated, and have been heeded. Happy days! Hope the same for you. Yes, you are right. My situation will never be resolved. I recognized that very early on. Pierre Elliott Trudeau was famous for his insouciant shrug. I shrug too but believe me, not in an insouciant manner. I shrug simply because my situation is impossible and because I will not give that foreign government or any of its agencies my data or my savings. They will have to steal both and do that on their own dime, using their own time.